Paris, during the first half of the 20th century, was one of the most vibrant and influential cities in the world. Major figures from every discipline of the arts chose Paris as their home and fed off one another’s creativity to produce some of the most important art ever seen. This record focuses on the incredible influence of Impressario Sergei Diaghilev, commissioner of such works as Stravinsky’s Rite of Spring; the irrepressible Jean Cocteau – writer, poet, artist, critic, film-maker, and self-appointed spokesman of the ground breaking group of French composers known as Les Six; and Pablo Picasso, one of the greatest geniuses in art history. 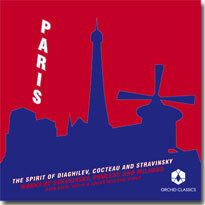 With music by Stravinsky, Poulenc and Milhaud, most of which was written for projects involving Diaghilev, Cocteau or Picasso, as well as extensive booklet notes, the principal aim of this programme is not only to give an idea of the wealth of great music that came out of Paris at this time but also to show how distinctly influenced by each other these creative minds were. Paris, during the first half of the 20th century, was one of the most inspiring and productive cities in the world. Major figures from every discipline of the Arts chose Paris as their home and fed off one another’s creativity to produce some of the most important art in history. Perhaps the most pivotal figure in the whole scene was Serge Diaghilev – the impresario whose commissions for the Ballet Russe included such works as Stravinsky’s Rite of Spring, Ravel’s Daphnis and Chloé, and Debussy’s Prélude à l’après-midi d’un faune. Diaghilev’s impressive circle of friends included the irrepressible Jean Cocteau – writer, poet, artist, critic, film-maker, and self-appointed spokesman of the ground breaking group of French composers known as Les Six, and Pablo Picasso, one of the greatest geniuses in art history. With music composed by Stravinsky, Poulenc and Milhaud, all of which were constantly involved both socially and professionally with figures like Diaghilev, Picasso and Cocteau, the principal aim of this programme is to show the incredible integration of all the different art forms that took place in Paris, and to give a real sense of the effect these great creative minds had on each other. All boundaries were removed, not only between the genres but also epochs, forms and rhythms when Diaghilev reinvented the ballet, Stravinsky composed tangos, and Cocteau reinterpreted Greek myths. Igor Stravinsky (1882-1971) was the great innovator of the 20th century. For a whole generation of composers and artists he was an admired and acknowledged leader. On seeing him for the first time Poulenc declared, “I thought it was God Himself”. Jean Cocteau described him, along with Picasso, as one of the two greatest influences in his life. Stravinsky created most of his violin music during the early 1930s. The inspiration for writing these works was meeting violinist Samuel Dushkin whom he described as a man of ‘musical culture’ and ‘delicate understanding’. Dushkin didn’t only become Stravinsky’s close friend and violin partner for several years, he also advised him on how his ideas could best be adapted to the demands of the violin as a concert display instrument. While they toured Europe and America together, Stravinsky composed new works for violin and piano, as well as arrangements of earlier works, for their recitals, always with Dushkin’s important advice. Stravinsky’s Suite Italienne, written in 1932, is based on music from his ballet Pulcinella, which he described as ‘my discovery of the past, the epiphany through which the whole of my late works became possible’. In 1918 he had spent some time in Naples together with Picasso: ‘We were both much impressed with the commedia dell’arte, which we saw in a crowded little room reeking of garlic. The Pulcinella was a great drunken lout whose every gesture, and probably every word if I had understood, was obscene.’ Two years later Diaghilev commissioned him to write a ballet on just such a commedia dell’arte subject, based on music by Pergolesi. Being aware that he could not forge Pergolesi, Stravinsky decided to repeat him in his own accent instead. The result was a score that was genuinely both Pergolesi and Stravinsky. Diaghilev, having expected a stylish orchestration, was shocked and, as Stravinsky recalls, ‘went about for a long time with a look that suggested The Offended Eighteenth Century’. However, when Pulcinella premiered in Paris in 1920 with choreography by Massine and sets designed by Picasso, it was an enormous success with the public. Chanson Russe is an adaptation of an aria from Stravinsky’s opera Mavra, which continued Pulcinella’s exploration of the past, and is dedicated ‘to the memory of Pushkin, Glinka and Tchaikovsky’. Pastorale for violin and piano (1933) is a beautiful arrangement of the original song without words for soprano and piano which was written in 1907 and dedicated to Stravinsky’s teacher Rimsky-Korsakov. Tango – a brief opus that distils the essence of the Argentine dance form – was Stravinsky’s first compositional effort after moving over to the United States in 1939. Francis Poulenc (1899-1963) was perhaps the best known of the group of composers known as Les Six. Their aim was to bring music forward and away from Wagnerism and Impressionism and champion the ‘anti-serious’ avant-garde inspired by music hall and circus. Many works of Poulenc bear the mark of Stravinsky, such as the last movement of his Violin Sonata, which he wrote during the Second World War and dedicated to the memory of the Spanish poet Federico Garcia Lorca, who was a victim of the Spanish Civil War. Another member of Les Six, Darius Milhaud was particularly influenced by music theatre, jazz and Brazilian dance. His ballet Le train bleu for the Ballet Russe had a very impressive cast of collaborators including a libretto by Cocteau and curtains by Picasso. In 1919, shortly after returning from Brazil, he composed Le Boeuf Sur Le Toit mixing together tangos, maxixes, sambas, and even a Portuguese fado. Originally written as a possible accompaniment to a Charlie Chaplin film, it was Cocteau who convinced Milhaud to use the music for a ballet instead. The action of Cocteau’s outrageous story, which takes place in slow motion inside a Manhattan bar during Prohibition, was admirably mimed by the Fratellini clowns from the Medrano Circus. Milhaud made several versions of the music, including one for violin and piano, to which Arthur Honegger contributed the cadenza. On Saturday nights the members of Les Six, accompanied by other figures from the Paris arts scene, would go after dinner to watch the mime shows of the Fratellini brothers, then retreat to the famous Gaya Bar where Cocteau would read his latest poems while Milhaud, Arthur Rubinstein and Georges Auric performed a six-handed version of Le Boeuf. This became such a favourite of the Gaya Bar’s owner that he named his new nightclub after the piece. Milhaud was given life membership.